Sure, an office shredder is a very handy tool to have in your office; you can shred old documents without having to leave your office. However, is this process secure enough for the sensitive documents you’re trying to safely destroy? The answer is no. Office shredders tend to break down as they become overworked, and they shred paper into strips which can often be reassembled. Should the wrong person get a hold of these shredded strips, you bet they find a way to put them back together to carry out a criminal act. Identity theft is on the rise, and therefore it is more important now than ever to have secure product destruction performed by professionals. This is the only method that guarantees your information is entirely safe, with on-site paper shredding. Worried about transporting your information off-site? On-site paper shredding services allow you to have all sensitive documents shred, without having to leave your workplace. IntelliShred will set-up an appropriate pick-up schedule for your business, and arrive to your location where the paper shredding process will take place right before your eyes. Our state of the art shred truck can shred in seconds what might take you hours with a handheld office shredder. Following your shred job, we’ll present you with documented evidence that material has been destroyed in accordance with state and federal privacy laws. 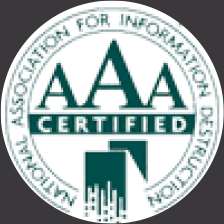 This Certificate of Destruction provides you with the peace of mind in knowing that your information is 100% irrecoverable. When you partner with IntelliShred and our on-site paper shredding, you may select from our one-time purge paper shredding services, or for ongoing paper shredding, our regular scheduled destruction services. Our professionals work quickly, but efficiently so that there is little interruption in your work-day. Our shred truck is equipped with industry leading shred technology, including video surveillance for additional security purposes. At IntelliShred, our on-site paper shredding services are not only secure, they are affordable as well. 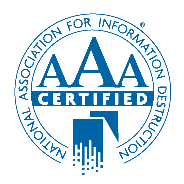 If you live in New Jersey or Pennsylvania and are looking to outsource your information management needs, we have a variety of solutions for you including paper shredding, hard drive destruction, and document storage services. Contact us today to learn more about IntelliShred and how our services differ from other paper shredding companies.